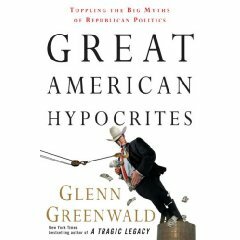 First today, we're joined by Glenn Greenwald, the author of Great American Hypocrites: Toppling The Big Myths of Republican Politics. Glenn is also a former constitutional law attorney and contributing writer at Salon. Read his columns here. Then, we'll look at the case of Troy Davis, an inmate on death row in Georgia, charged with the 1989 killing of police officer Mark Allen MacPhail. Troy is scheduled to be executed on October 27th, despite doubts that exist regarding his guilt. We have two guests for this discussion. One is Martina Correia, Troy Davis' sister, who is also the National Steering Committee Chair for Amnesty International USA's Program to Abolish the Death Penalty and Amnesty International's State Death Penalty Abolitionist Coordinator in Georgia. The other is Deirdre O'Connor, Professor at Emory Law School and Director of Innocence Matters. First today, we’re joined by Glenn Greenwald, the author of Great American Hypocrites: Toppling The Big Myths of Republican Politics. Glenn is also a former constitutional law attorney and contributing writer at Salon. Read his columns here. Then, we’ll look at the case of Troy Davis, an inmate on death row in Georgia, charged with the 1989 killing of police officer Mark Allen MacPhail. Troy is scheduled to be executed on October 27th, despite doubts that exist regarding his guilt. We have two guests for this discussion. One is Martina Correia, Troy Davis’ sister, who is also the National Steering Committee Chair for Amnesty International USA’s Program to Abolish the Death Penalty and Amnesty International’s State Death Penalty Abolitionist Coordinator in Georgia. The other is Deirdre O’Connor, Professor at Emory Law School and Director of Innocence Matters.